Leap2, the iOS search app that re-imagined search on mobile devices, is back eight months after its debut with some pretty significant changes. With the update, available in the iOS App Store(s AAPL) starting Tuesday, users will find the original navigation interface, one of the most interesting things about it, has been tweaked, and that there are fewer categories for search results. Then there’s the social “leap it” feature, which switches up the entire emphasis of the product. There’s also good news for Android(s goog) users: Leap2 is now available on the Google Play store. The team behind Leap2, which is based in Kansas City, Kan., set out to create a mobile search app tailored to smartphone use: touch-oriented, one-handed, and fit to a small screen. In other words, the opposite of Google’s desktop search standard. In my original look at the app, I talked about how it was successful, as well as areas that it needed to work on, especially speed and the overall look. The update addressed some of that, though the app’s speed still isn’t as snappy as I’d like. However, the new navigation and simplification, on the whole, are positive changes. I rather liked the scrolling wheel in the previous design, but the volume of choices it offered could be a bit unwieldy. With the new look, the results of your search appear under tabs in the lower half of the screen — images, local, web, a sharing tab for Twitter, Facebook(s FB) and email, and social buzz results. Tapping (instead of scrolling down from the top of the screen) gives you a fullscreen view of any of your results, and an icon in the lower right takes you back to your results when you’re done. The social part is the major project the Leap2 team has been working on. They’re repositioning it as a place to search for things in the present, but also as a tool for extending that search out into the future for topics you want to stay on top of across the entire web. You can use Leap2 to create a hashtag and anywhere that tag appears on a social network or somewhere on the web, it’ll show up in a specific tab in the app. If I’m searching for a Canon D500 camera and I want to buy it in the next week, I can create a sepcific query and receive price deals. For the first time we’re taking the element in time and moving it foward with real time for the broad web, and not just news alerts. It’s taking any slice of information and moving it forward. Just because someone is searching for a topic now, it doesn’t mean their interest ends once they find an answer. In the image above I searched for an upcoming festival. There aren’t any results yet, but there will be this weekend when it’s taking place. 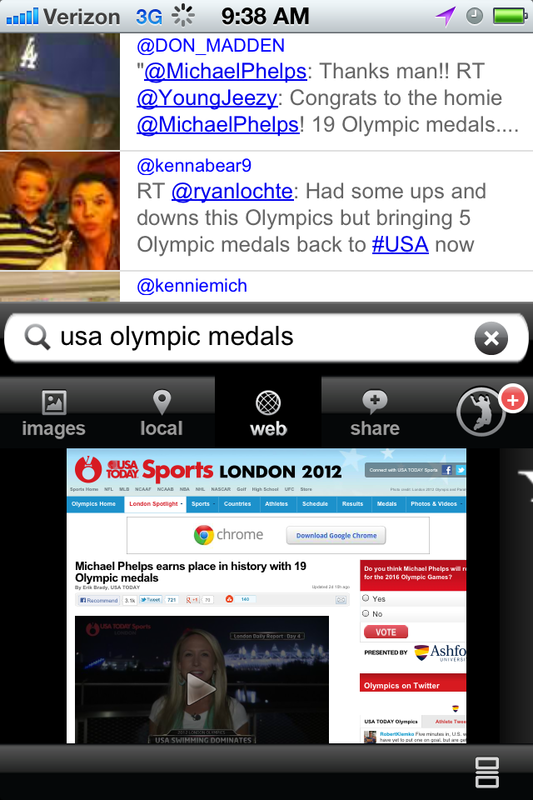 Leap2 can keep multiple hashtag searches going at the same time. I can have “baseball trade” and “Philadelphia restaurant opening” going simultaneously since those are topics I’m always going to want to be updated on. And it won’t just be a list of links; Leap2 delivers results based on the currency of the information, links that are being shared often and things that people are talking about — for example, things that have been retweeted. Adding context and making search results relevant to what people are talking about is great. My issue is still the overall look and feel of the app — it needs to be smoother and it needs a more polished look. But it’s still a decent idea. And we can always use apps rethinking how we’re using our mobile devices, especially for a category like search or discovery, which continue to be major challenges as we deal with the overflow of information that the web brings.